The Return of Shalsheles: Yaaleh! Thirteen years after they forever changed the landscape of Jewish music with their debut album and three years after the release of their fifth album, Shalsheles is back, ready to delight their legions of fans with an all new single released just in time for the yomim tovim, aptly titled “Yaaleh”. The song, composed, as always, by Yitzchok Rosenthal, is vintage Shalsheles and a tantalizing sample of what is in store on Shalsheles VI, due to be released in time for Chanukah and produced by CD Eichler of AKA Pella fame. With their trademark harmonies, the members of Shalsheles, which include Yitzchok Rosenthal, Baruch Aryeh, Chaim Block and Simcha Sussman, shine both individually as soloists and as integral components of a vocal symphony that is electrifyingly beautiful. Arranged by Dudi Kalish and edited by Ruli Ezrachi with mixing by Nochi Krohn and post production by Nochi Krohn and CD Eichler, Yaaleh features additional vocals by a Ramat Beit Shemesh childrens’ choir, under the direction of Simcha Sussman. With a timeless sound that is as fresh and as heartwarming as it was when Shalsheles first captured the hearts of Jewish music lovers everywhere more than a decade ago, Yaaleh is a solid proof that Shalsheles is not only back, but better than ever. 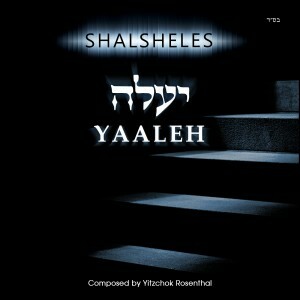 Yaaleh is available for download on iTunes. For more information on Shalsheles visit them at www.shalsheles.com or on Facebook at www.facebook.com/shalsheles.